Gaze Tracker is a highlight of the radically immersive ARTLENS Gallery space that uses advanced eye-tracking technology to reveal where visitors’ eyes move across a work of art. ArtLens Exhibition is the focal point of the ARTLENS Gallery experience, a radical, immersive digital initiative that includes the ArtLens Studio, ArtLens Wall, ArtLens App, and Digital Beacon. Transitioning away from traditional touchscreen technology, ArtLens Exhibition interactives respond seamlessly to body movement using barrier-free projections. These interactives focus on composition, gestures and emotion, symbols, and purpose as they relate to artworks in the CMA’s collection. Gaze Tracker uses advanced eye-tracking technology to reveal where visitors’ eyes move across a work of art. 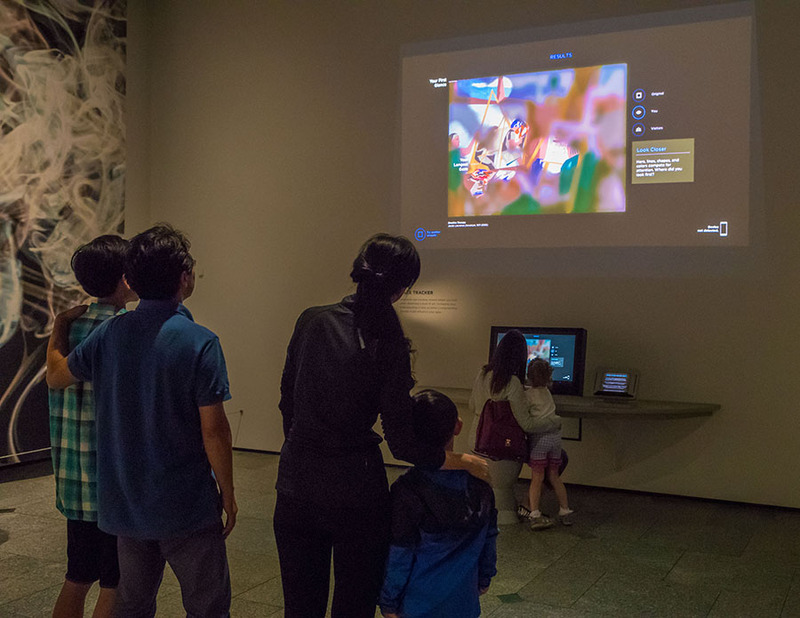 Gaze Tracker encourages visitors to explore the elements and artistic choices that impact the composition of an artwork. 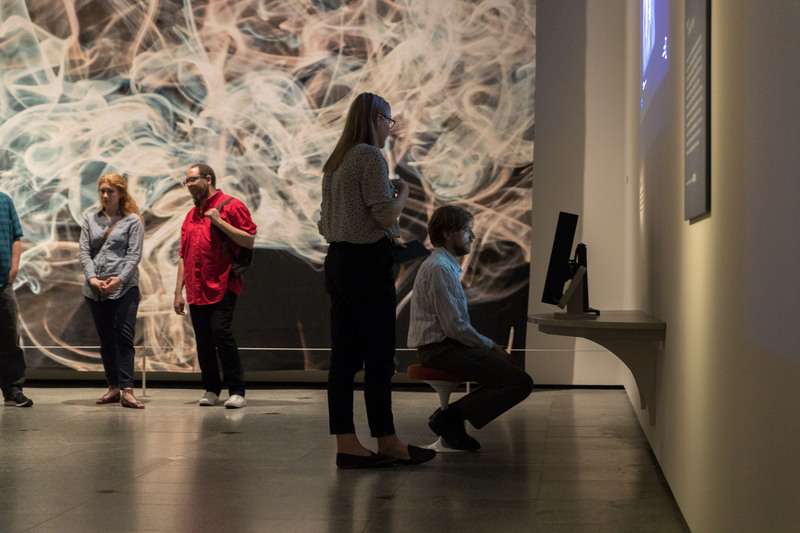 At Gaze Tracker, visitors sit in front of an ADA-compliant monitor, wait for the interactive to calibrate with their eyes, and look at an artwork from the CMA’s collection for 15 seconds. Innovative eye-tracking reveals with consistent accuracy where a visitor focuses when looking at the work of art, increasing the visitor’s understanding of how an artist’s compositional choices influence how they look at art. 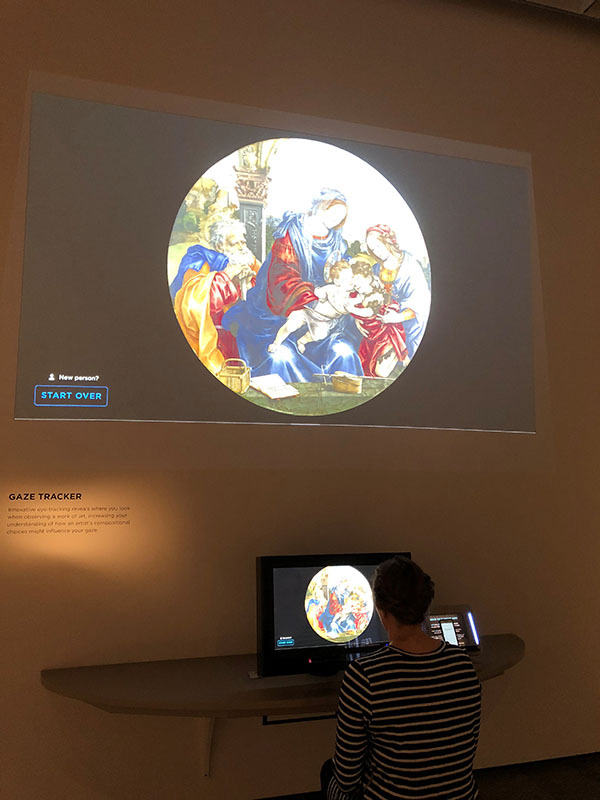 On a large video projection viewable by other visitors and on the individual monitor, the interactive shows visitors the path their eyes took while observing the work of art, including what grabbed their attention first, what detail they viewed the longest, and what elements they ignored. At the end of the interactive, visitors can see an interpretation of the artist’s intent regarding composition as well as the artwork’s identification, gallery location, and aggregate results from other visitors. The large video projection creates a social experience where multiple visitors can become involved to learn how others viewed the same artwork. Docking an iOS or Android device at the Gaze Tracker station saves all explored artwork directly to the “You” section of the ArtLens App via Bluetooth technology. Visitors can then use the app’s wayfinding technology to easily locate saved artworks in the galleries throughout the museum to view the actual artwork and access additional multimedia interpretive content. Visitors engage with one artwork for an average of 76 seconds at Gaze Tracker. Research by John Elkin at the School of the Art Institute of Chicago shows that museum visitors, on average, view an artwork for 2 seconds, spend 10 seconds reading the label, glance briefly back at the artwork, and move on. After preliminary testing, the CMA has found that visitors spend an average of 76 seconds engaging with one work of art at Gaze Tracker. Additional Google Analytics data showed that between August 24 and October 31, 2017, visitors viewed 3,969 artworks at Gaze Tracker, which equates to approximately 67 artworks per day. Overall, Gaze Tracker is increasing engagement with the CMA’s extensive collection while also minimizing anxiety and fear about the “proper” way to view and talk about art. Visitors familiarize themselves with the CMA’s collection at Gaze Tracker while gaining new insights into how artists use color, composition, and line to create movement across a work of art. By looking closely at multiple objects, visitors can understand what elements or details they are consistently drawn to first and take this information out into the galleries. Gaze Tracker does not showcase technology for technology’s sake, but rather provides visitors with the toolsets to look longer and closer at works of art anywhere. This interactive is grounded in rigorous pedagogy and the collected data could impact the future of exhibition design at the CMA. After a visitor views an artwork at Gaze Tracker, the interactive provides the artwork information, including gallery location if the artwork is on view. With consistent accuracy, Gaze Tracker shows visitors how they look at art, highlighting the details visitors viewed first and for the longest amount of time. The CMA’s digital team is proudest of the changes made to the backend system’s design. The CMA’s custom-built catalog management system pulls live content, writes it once and then updates it everywhere, making any artwork information or interpretive content updated by the curatorial, registrar, and interpretation departments immediately accessible in ArtLens App, as well as at ArtLens Wall and in any outward-facing interactive. 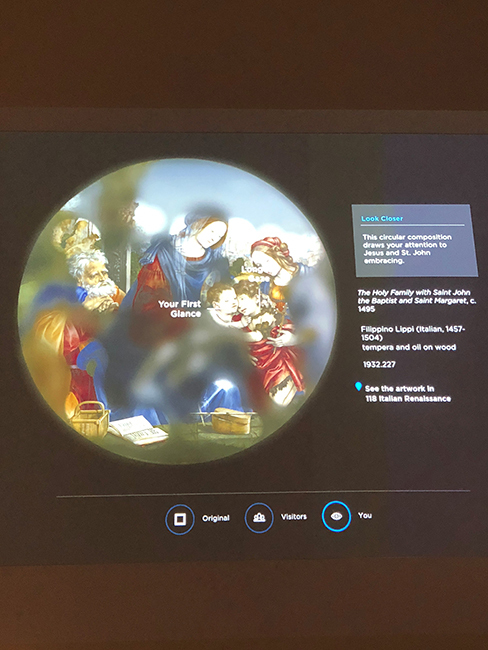 All of CMA’s digital experiences, like Gaze Tracker, pull their live content from a unified backend system, composed of the collection catalog and management and digital asset management systems. New API improvements make future changes to the space more manageable since the interactives focus on frontend technology. This backend system along with custom-designed web tools allow the CMA to update the ARTLENS Gallery experience at any time by adding more content, artwork, and games without relying on outside resources. Interpretive content is a significant part of the art-viewing experience; however, artwork labels are historically static and uninspiring. The backend system will enable the CMA to define a “new” type of label that is intuitive and fun. Gaze Tracker becomes a social experience while encouraging visitors to explore the composition of artworks. Gaze Tracker bridges the gap between visitors and art in a transformative experience, empowering people to build lasting relationships with CMA’s world-renowned collection. Visitors can take the skills they develop at Gaze Tracker, and apply them to works of art anywhere, even beyond CMA. 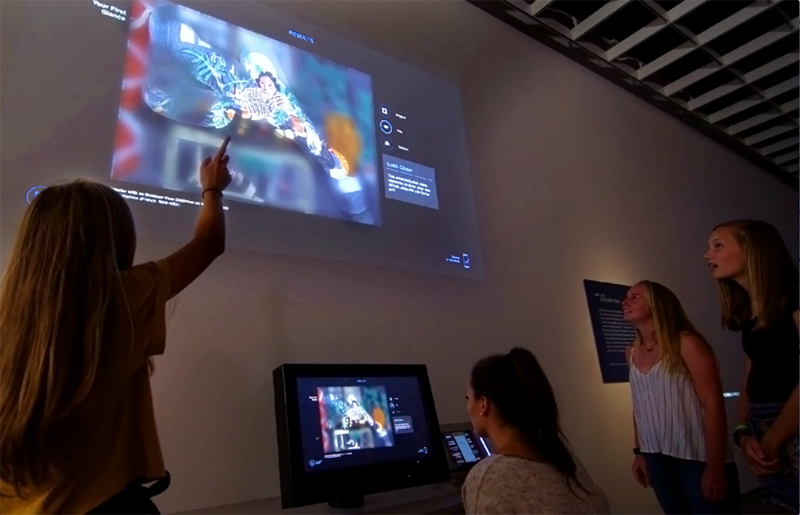 ArtLens Exhibition interactives, like Gaze Tracker, reduce the intimidation of art museums and create a comfortable, welcoming experience for first-time and repeat visitors.